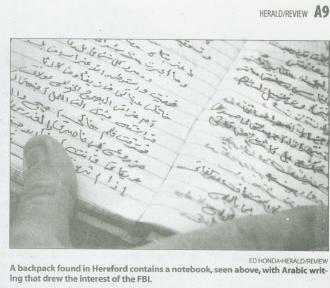 HEREFORD, AZ -- It is not unusual to find backpacks near their home, but a local man and his wife were surprised to find one that contained a diary written in Arabic. Walter Kolbe said he was chasing some javelinas away from his home Thursday when he stumbled upon the backpack. He said he brought it home and didn't think much about the find. He and his wife, May, went away for the weekend. When they returned Sunday, his wife's curiosity led her to look into the backpack. That's when she discovered the diary. A path used by illegal immigrants is on their property, which is on the east side of the San Pedro River, Walter said. "I found it (the backpack) about a hundred yards from the house, near a barbed-wire fence," he said. "I was just going to throw it in the trash." After his wife went through the backpack, which included dirty clothing, they decided not to discard the material because of the diary. Most of the writing was in Arabic, though there was some Spanish writing in it as well, May Kolbe said. Looking through the small book, she noticed two names and telephone numbers -- one listing in Canada and the other Iran -- and confirmed the beginning numbers were the international codes for those two countries. Walter Kolbe called the FBI on Monday morning and agreed to bring the diary by the local office the next time he was in Sierra Vista. The FBI representative also told him that if the agent with responsibility for terrorism investigation thought the diary was important they would make arrangements to pick it up. Such turned out to be the case. An agent called Tuesday and said they would show up to pick up the material, which they did that morning. The Kolbes said they wonder how many Middle Eastern people are coming into the United States illegally. Rob Daniels, a spokesman for the U.S. Border Patrol's Tucson Sector, said he is not allowed to talk about the number of non-Mexicans his agency detains. "We can't get into specifics about the number," Daniels said. Mario Villarreal, (sic) a spokesman for the U.S. Border Patrol headquarters in Washington, D.C., said 99.4 percent of the 955,310 people apprehended by the agency from Oct. 1, 2001, through Sept. 30, 2002, were from the Americas, which includes Canada, Mexico and other Central and South American nations. The remainder comes from 140 countries, he said. "Because of 9-11 (the terrorist attacks on the United States on Sept. 11, 2001) there has ben restrictions and guidelines when talking about special interest countries," he said. However, the Border Patrol continues to seek information about illegal immigrants and individuals are encouraged to call (877) 872-7435.